I really liked the lastest Transformers game called “Transformers: War for Cybertron“. The game is really great and the work in the sound was brilliant, so I talked to the guys at High Moon Studios’ sound team asking some things about the audio work on the game. Thanks go to all the guys on the team for taking time to answer my questions! Designing Sound: How early did you guys start to work on the game? How was your first contact with the other teams? Mark Loperfido: As in-house sound designers, the luxury was there for us to begin work on the project from day one. We determined early on that each area of the war torn Cybertron was very much unique and would need to have an equally unique soundscape to enhance the game-play. In the Kaon areas, for example, we created a more dark and ominous sounding ambience using droning synth sounds, metallic “wronks” and spooky airy type sounds. This was home to the Decepticons so it made sense for us to create that kind of uneasy vibe for the player. Alternatively we wanted to have Iacon feel more bright and shiny and give the player a sense that they are now in an area that is home to our heroes, the Autobots. Some of my favorite areas in Transformers: War for Cybertron were those that had been infused with Dark Energon. The Dark Energon concept is a major theme in the story and allowed us to include some very cool organic, space-alien type sounds which you would not find anywhere else on Cybertron. Rob Burns: Starting at the very beginning of the project each sound designer is embedded with a cross discipline feature team. The feature teams are each responsible for a particular mechanic (weapons, vehicles, AI etc…) or level and each member of the team is encouraged to give feedback to every other member of the team. As a result the communication within the team is really good and we’re able to influence design decisions that affect sound such as weapon rates of fire, character foot speeds, vehicle acceleration, and overall level pacing. 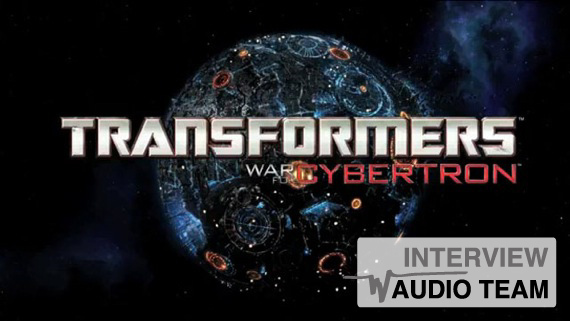 DS: How did the previous Transformers shows/films/games influence the sound of Transformers: War for Cybertron? In terms of sound, what is different in this game? Mike Niederquell: As soon as we knew we would be working on a Transformers game we started referencing the original cartoons as well as Michael Bay’s films. I would say the original cartoon was probably the biggest influence for us. There’s something iconic about those classic generation one transformation sounds and we decided early on that we would use those for our main inspiration when designing our own transformations. One thing I did take away from the films that personally influenced me was how clean all their sounds were. Those guys did a great job at making really interesting sounds without layer a bunch of tracks on top of each other. Throughout development I tried my best to stick with that process and it really helped when trying to get sounds to cut through the mix. DS: In an interview for DS, Erik Aadahl told me that they tried to make sonic differences between Autobots and Decepticons. Did you guys make some sonic differences on those races? How the “war” environment affected the way you design the sounds of all the battles and stories? Mike Niederquell: This biggest way we tried to portray a difference between the two factions was through the ambient environments. If you’re fighting in Decepticon territory (Kaon) things will sound more metallic, resonant, and overall more eerie. On the opposite end, Iacon, the Autobot inhabited territory will sound more ominous, synthesized and possibly angelic. We wanted to portray that the Autobot’s stood for hope and held an optimistic feeling towards saving the planet of Cybertron. One audible faction difference you’ll hear all over the game is the sound of the flying jets. The Autobot’s have a more pleasant purr similar to a formula one car and the Decepticon’s have a pulsating, screeching howl as they fly over. Dry ice was used on one of those tracks for the Decepticon bys. DS: How much recording was needed? I know you hired some great recordists such as Watson Wu and Charles Maynes. Could you tell us some stories about the field recording sessions you had and the source elements recorded to design all the sounds of the game? Rob Burns: Watson and Charles were both great resources for us on this project. From the beginning we knew that the Transformer’s vehicle and weapon sounds were going to be really important pieces of our overall soundscape and we wanted to make sure we the best source material possible to design those sounds from. Watson took care of all of our vehicle recordings. He started out by doing a bunch of quick recordings of various cars and trucks he thought might work for the project so we could audition them and find the right sounds to match the different vehicle classes we had in-game. Once we had selected the vehicles he created a comprehensive library of each one consisting of accelerations, decelerations, consistent rpm rates in each gear, and revs. He also recorded all the door, trunk and hood sounds for us to use in the transform sounds. Charles was able to organize field recording session of heavy weapons and explosions for us just outside of Las Vegas. For the weapons we recorded several heavy machine guns and a 20mm anti-tank rifle that looked like it could easily be mounted on a Transformer’s arm. For the explosions we recorded several types of explosive materials including detcord, gasoline, and black powder in varying amounts. In both cases we recorded several different perspectives which we were able to utilize with our in-game tools. DS: And what about studio/Foley recordings? What kind of props and materials did you record for the robots’ sounds? Mike Niederquell: We did a lot of recording preparing for this project. We recorded our own IRs for reverb spaces. We recorded countless mechanical devices – if it had a servo we recorded it. A few years back I managed to grab a car door from a local auto dump. We used it a bit for our previous title, The Bourne Conspiracy but it sure paid off having that sucker for this game. I can’t count how many times I re-recorded that thing using different micing techniques and performances depending on what was happening and needed for the game (footsteps, bullet squib impacts, vehicle collisions, metal ambient wronks, etc.). Rob also recorded a bunch of power tools through a guitar pickup and a Marshall stack…that’s right, just like Van Halen’s “Poundcake”. We recorded so many odd and simple things throughout the development. Another good one was an idea I stole from Ben Burtt – a Slinky. I ended up using a recording I got from that to design the mounted turret gun shot sound. DS: The sounds of the robots’ transform/morph have been very iconic in all the Transformers productions. How was your approach when designing transform sounds for each character? Rob Burns: For the transform sounds we really wanted to combine the familiar iconic G1 transform sound with some of the detail that the transforms in the Michael Bay movies had. Optimus is the most straight forward example of it. His transform sounds are straight recreations Mike made of the original G1 sound combined with heavy metal impacts and servos. That served as a starting point and for all the other characters we deviated slightly from that formula creating variations for each character. It was important to all of us that each character was unique and and in some way reflected their individual personality. Sideswipe is fast so he has a lot of fast whooshes, Brawl is rough and raw so a lot of his sound is processed through some guitar amp plug-ins and Megatron is powerful so his sound is full of heavy impacts. DS: And what about the huge amount of weapons, explosions, etc? Rob Burns: The main idea behind the weapons was to combine the real world sound of a ballistic projectile with a sci-fi twist. The recordings we did with Charles were used as the basis of the overall sound and then we layered additional mechanic sounds, synth elements and servos on top of them. The same goes for most of the explosions. In both cases we utilized the different perspectives we recorded. Chris, our audio programmer was able to expose a distance variable for us that we could reference within our soundcues giving us the ability to crossfade between a close, medium and distant sound for each of the weapon fire and explosion effects. From a gameplay perspective it’s really helpful, especially in multiplayer matches because it helps differentiate other player’s gunfire from your own and gives you a sense of your proximity to the battle. DS: Another element I loved was the general ambience of the Cybertron world. Did you have any pattern to follow on the ambience layering? What direction or guideline was used when designing them? Ian Mika: We didn’t necessarily have any set patterns or templates to follow, but we had the basic idea of how the Autobot spaces would sound compared to the Decepticons (as Mark and Mike described above). Many of the original ambiences we created were very synth heavy and over time they evolved to become more of a mixture of organic and synth sounds. The organic aspect would usually help create more movement and more airiness, while the synth bed would help that otherworldly quality come across. While the ambient beds really helped glue the ambient audio as a whole together, it was the “player positional” sounds that really made the spaces come alive. With these sounds randomly firing off around the player we were able to get pretty crazy with synthy robot sounds, strange Cybertronian insects, creaking metallic wronks, etc. The fact that these things are only heard and not seen allowed us to go crazy and use our imaginations to build life into the planet of Cybertron. The levels themselves are also riddled with audio emitters, anything that looks like it should have a sound on it does. The fact that we were embedded in the level teams from prototype to final product meant we knew these levels like the back of our hand and we had time to get as detailed as possible. DS: Dialog is another iconic feature of Transformers. How was it recorded? Did you have any special method/system for the dialog implementation? Rob Burns: We did all of our dialog sessions at PCB productions in Los Angeles. Keith Arem was the dialog director and was able to help us out a lot with the casting. Peter Cullen of course is Optimus because it just wouldn’t feel like Transformers without him. For the remainder of the characters we tried to keep them in the spirit of the original cartoon series as much as possible. Chris even wrote a custom vocoder for us to help nail Soundwave’s voice affectionately named the Soundcoder Wave-A-Tron. John Drelick: The challenge with AI incidental dialog (aka. “battle chatter”) was to balance repetition in order to avoid annoying the player, and to ensure that the wide variety of dialog we had would all have a chance to play. For example, if the player’s character played their “I killed my target with a headshot” line every time the player got a headshot, the buddy AI would never have the chance to play their “my teammate killed their target with a headshot” lines. To achieve this, AI dialog was subdivided into groups for each behavior (ex. all “I killed my target with a headshot” lines would be placed in a group). Each group had an initial chance to play value and a re-trigger delay controlling the amount of time the lines of dialog belonging to the group would have to wait until they would be allowed to play again. The re-trigger delay was a random number with min/max values to help prevent predictable patterns. All AI dialog groups were also assigned to two master groups for when the player was in combat and not in combat so that only dialog appropriate for the situation had the chance to play. (ex. “I just transformed into a robot/vehicle” lines felt out of place during combat but were great during non-combat). This required a bit of investment in time to hook up but we felt the final results were well worth it. DS: Regarding implementation and mixing… What kind of audio tool did you use and how you used it? Is there some real time controls/effects implemented? Chris Sakanai: Transformers: War For Cybertron utilized FMOD for the low-level playback engine which gave us access to a powerful mixing bus and a wide variety of DSP effects. We then implemented a custom mixing system on top of it that allowed us to modify the volume, pitch, and DSP parameters of each node in the mix bus. The sound designers could then save snapshots, or “presets”, of any of the bus nodes and recall them during game play. The mixer would then automatically interpolate between the DSP parameter values over a specified amount of time when a preset was enabled/disabled. The presets could be used to do things like duck the sound effects bus when dialogue was played, apply unique reverbs for each room in a level, or dynamically apply flange and EQ to the dialogue when characters spoke to you over the radio. We also created a real-time dialogue system that let the AI respond to the players actions. The dialogue system was hooked into the AI state-machines so we could get feedback about what the enemies or your buddies were doing. For example, every time an AI notices the player, starts an attack, retreats, throws a grenade, gets a head-shot, etc. the dialogue system is notified. The fact that the AI verbally reacts to what the player is doing adds an enormous amount of believability and really makes the characters come alive. I discovered (by accident) that TV remote controls can be “picked up” by a guitar pickup. You get a pulsing sorta beep noise! I guess there is some sort of electromagnetic field produced when you press the buttons. Using the power drills is an amazing idea though! “Oh, I didn’t see you there”, classic line Mike. The Power Drill taken from Van Halen track was a great idea. Although, I had to quickly turn down my headphones when watching the video as the high frequencies almost made my ears bleed :-). I cant wait to give this game a listen. I have stolen the slinky trick from Ben Burt too many times to count, and it can be used in so many different ways. I am also going to try the remote control through a guitar pickup Jamie, thanks for the idea. I just noticed that you had Watson Wu and Charles Maynes take care of the recordings of the vehicles. It doesn’t get any better than that! Hey Tom, you should have heard some of the other parts I cut out from the video. Yikes! Sorry about that though, but now you know what the source kind of sounds like through that awesome point and shoot camera. Oh yea, Watson and Charles did a great job capturing vehicles, guns and explosions for us. Would love to work with those guys again. Does FMOD, as you’ve implemented it, support hardware accelerated audio via OpenAL? For those of us with Creative sound cards on Windows 7 we’ve been able to configure the .exe’s to run in WindowsXP compatibility mode and configure the game to use Creative Alchemy to intercept the DirectSound calls. This doesn’t always work though depending upon the game. Any insight you could provide would be greatly appreciated.